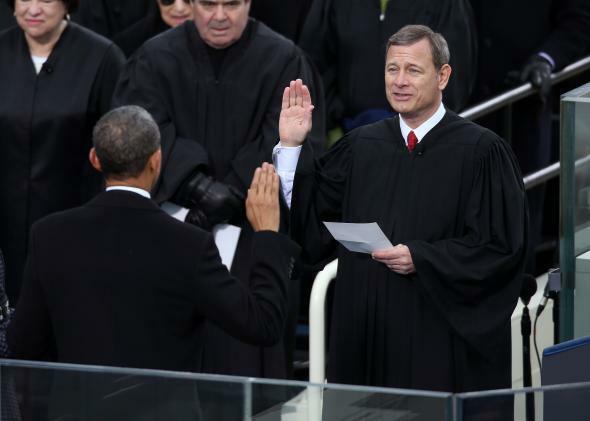 King v. Burwell decision: John Roberts explains why he just saved Obamacare again. Chief Justice John Roberts swearing in President Obama, whose signature law he just saved again. Once again, Supreme Court Chief Justice John Roberts has helped save the Affordable Care Act, this time in a 6–3 decision that upheld the government’s right to provide health coverage subsidies to residents of states that rely on the federal insurance exchange. We’ll have more in-depth coverage of the ruling through the day, but at the moment, I think the two paragraphs from the end of Roberts’ opinion really boil down the essence of the case. A tiny bit of background: The entire case at hand, King v. Burwell, hinges on a brief passage that says Americans qualify for subsidies if they purchase insurance on an exchange “established by the State.” The law’s challengers argued that this barred the government from giving tax credits to people who bought their coverage through healthcare.gov because their state chose not to set up their own exchange, which, if true, would have basically decimated insurance markets across the country. The law’s authors say that the passage was likely a drafting error and that Obamacare was meant to help people buy insurance, regardless of whether they were using a state exchange or the federal site. I’ll let Roberts take it from here. I’m guessing this passage will go down as a lasting statement about judicial humility.